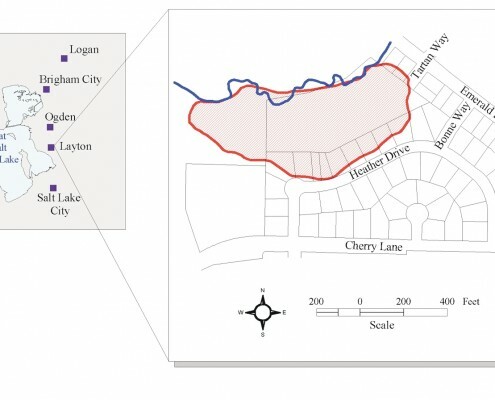 Location map of the Heather Drive landslide. Red cross-hatched area shows the area of landslide movement in August 2001; blue line is South Fork Kays Creek. 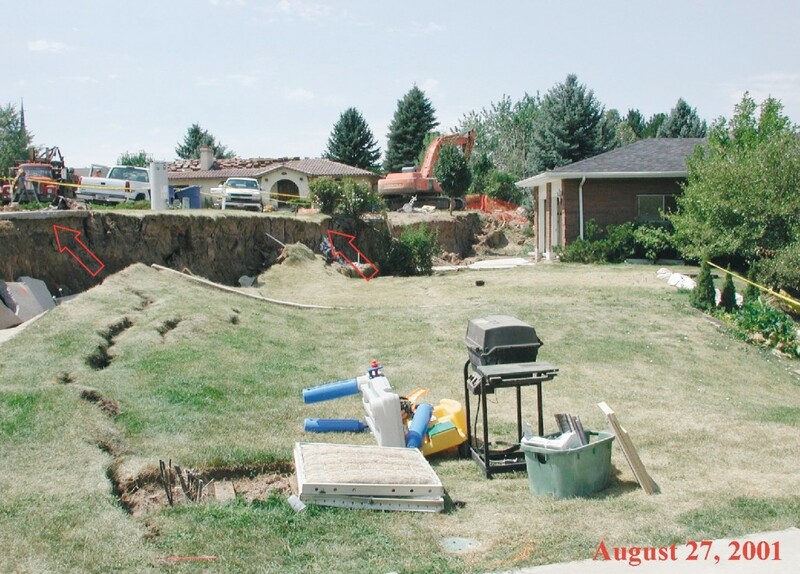 The Heather Drive landslide in late August 2001 damaged six homes and interrupted utility service, forcing families to evacuate and causing over $1 million in losses. The Heather Drive landslide is on a gentle slope above South Fork Kays Creek in Layton. Movement in 2001 was largely a reactivation of a prehistoric landslide. This was the latest of several recent landslide reactivations in Layton, most of which occurred in 1998. All of these landslides, including Heather Drive, involve the failure of soft, silty and clayey sediments of prehistoric Lake Bonneville. Lake Bonneville sediments in the Layton area are particularly prone to landsliding, and periodic reactivation of existing landslides is a common pattern. 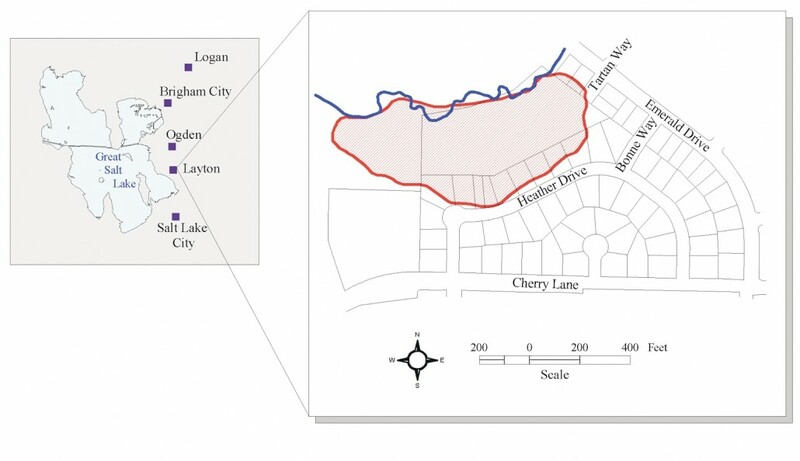 In its role in emergency response, the Utah Geological Survey monitored movement, documented landslide features, assessed the hazard, and provided advice and recommendations to Layton City and homeowners. 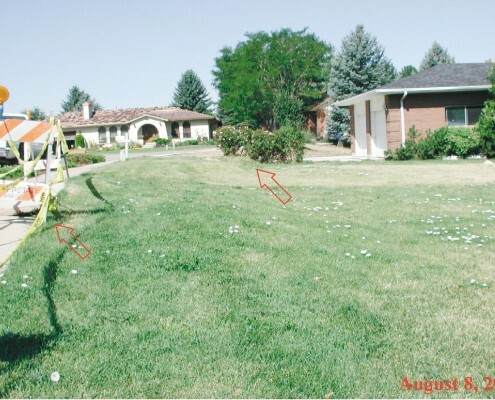 The timing of landslide movement documented by homeowner interviews and movement monitoring indicates a long gradual period of slow or intermittent movement followed by relatively rapid movement and an abrupt stop. One homeowner noticed foundation cracks in 1998 that were likely caused by landslide movement. Another repaired a driveway in July 2000 and noted continual displacement through July 2001. Therefore, the landslide was moving continually but at a very slow rate since at least July 2000. The landslide movement rate increased in late August 2001 and the majority of landslide movement took place between August 20 and 29. The most dramatic landslide movement occurred between August 27 and 28, when the upper landslide dropped vertically 2 to 2.5 feet along the main scarp separating the top of the landslide from ground along Heather Drive that didn’t move. On August 25 and 26 prior to this dramatic drop, the upper landslide was dropping vertically about 1 foot per day along the main scarp. Nearly all landslide movement had stopped by August 31. The lower landslide moved horizontally at least 7 feet to the north toward South Fork Kays Creek, restricting creek flow. As movement increased in late August, houses and underground utilities quickly showed landslide-related damage. The houses on the landslide became severely cracked, continually creaked and popped, and the doors, walls, and floors buckled and tilted in response to movement. Water, natural gas, and electricity services were discontinued because of landslide damage to buried lines. In response, the homeowners evacuated their houses and were moved out by August 24….. Movement along the main scarp caused most of the damage to houses and utilities. Of the six houses damaged by the landslide, two straddled the main scarp and four were on the landslide just below the main scarp. Three were eventually moved off the landslide and three were demolished due to landslide-related damage. The electric and natural gas lines were relocated to the south side of Heather Drive. 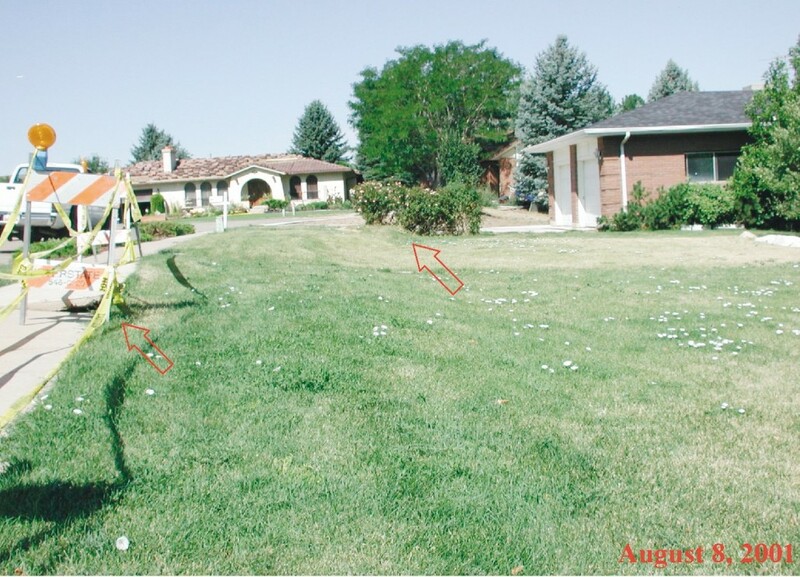 Preliminary estimates of homeowner equity losses, lending institution losses, costs to Layton City, and costs to relocate utility lines exceed $1 million. Amore detailed loss estimate will be made once lending institutions and homeowners complete final decisions on the outstanding mortgages. Standard homeowner’s insurance does not cover landslide damage, and none of the homeowners had landslide insurance to cover their losses. The cause(s) of landslide movement is uncertain. Little is known about subsurface conditions and factors controlling movement because the landslide has not been studied in detail. The most common causes of landslide movement are adding weight to the upper landslide, removing support from the lower landslide, or increasing the ground-water level. 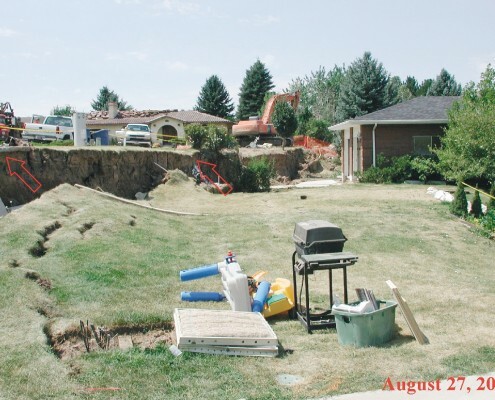 These causes could not be documented at the Heather Drive landslide, although movement in 1997 or 1998 following several years of above-normal precipitation indicates increased groundwater levels may have played a role in initiating movement. The landslide then moved intermittently and very slowly for years, perhaps as the sliding surface developed and the silt and clay along the sliding surface gradually reduced in strength until late August 2001 when the majority of movement took place. Even though landslide movement has stopped, the landslide remains potentially unstable and could enlarge, placing additional houses, streets and underlying utilities, and South Fork Kays Creek at risk.